Paul Miles travelled around Australia with Motley Crue on their December 2005 Australian Tour with Motorhead. Many of these photos were featured in B&W in the book Mötley Crüe Down Under: On Tour with The Carnival of Sins and are seen here in colour for the first time. All photos in this gallery are Copyright © 2005 Paul Miles. All rights reserved. May not be used without written permission. 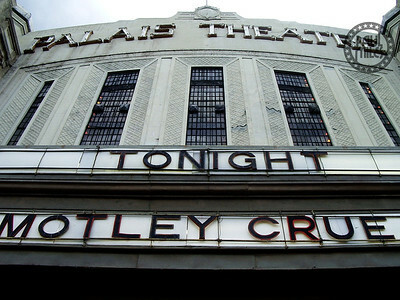 Melbourne's Palais Theatre in St. Kilda ready for Motley Crue's show that night on 7 Dec 2005 with Airbourne in support. Motley Crue's Tommy Lee DJing at The Loft nightclub in Melbourne, Australia, after the band's concert on 7 Dec 2005. Up close with Tommy Lee as he and DJ Aero play the Loft nightclub in Melbourne during Motley Crue's Australian Tour in December 2005. 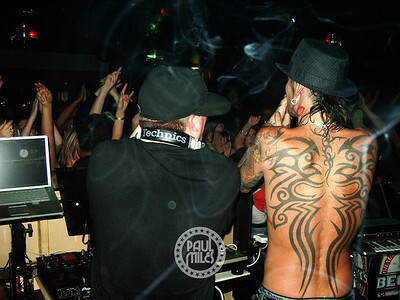 In the DJ booth with Tommy Lee and DJ Aero at The Loft nightclub in Melbourne, Australia on 7 Dec 2005. 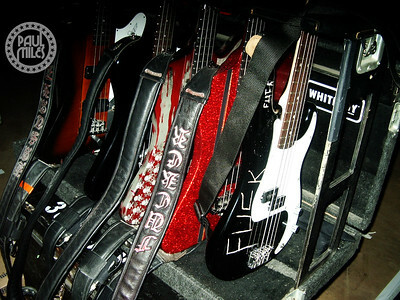 Nikki Sixx's bass guitars backstage racked up and ready to rock Adelaide, Australia on 8 Dec 2005. Motley Crue's setlist taped to the side of the stage entrance in Adelaide, Australia on 8 Dec 2005. 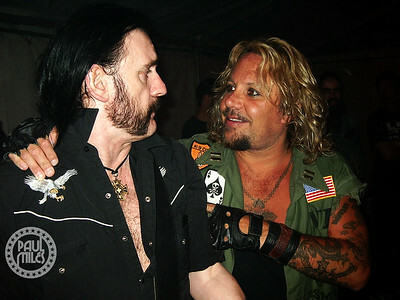 KILLED BY BREATH: Lemmy from Motörhead greets Mötley Crüe's Nikki Sixx backstage in Adelaide, Australia in 2005. 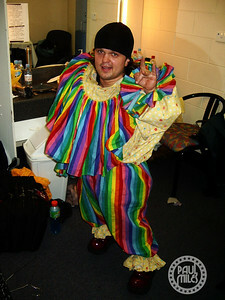 "Mighty Mike" Murga in his dressing room at the Adelaide Entertainment Centre on 8 Dec 2005 before opening the stage show for Motley Crue. Avid photographer Nikki Sixx shooting the memorial seat of the late AC/DC singer Bon Scott on a visit to Fremantle Cemetery during Motley Crue's 2005 Australian Tour. 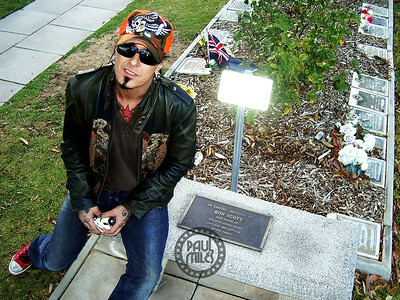 Motley Crue's Nikki Sixx at the grave of the late AC/DC singer Bon Scott during a visit to Fremantle Cemetery, Perth on 9 December 2005. Nikki Sixx getting a copy of the Paul Miles photo "Killed By Breath" in his dressing room backstage at Claremont Showgrounds, Perth before Motley Crue's performance at the Blackjack Festival on 10 December 2005. 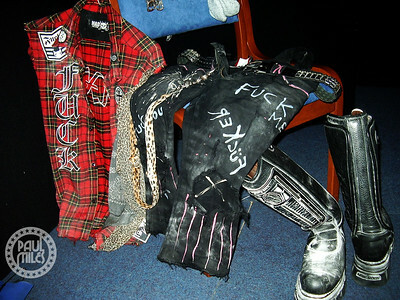 The stage clothes of Nikki Sixx in his dressing room at Claremont Showgrounds, Perth before Motley Crue's headlining set at the Blackjack Festival on 10 December 2005. Vince Neil side of stage stepping Motorhead's Lemmy through the verse lyrics to Motley Crue's version of Anarchy In The USA, before they sing this encore song at Blackjack Festival on 10 December 2005 to complete their Australian Tour. 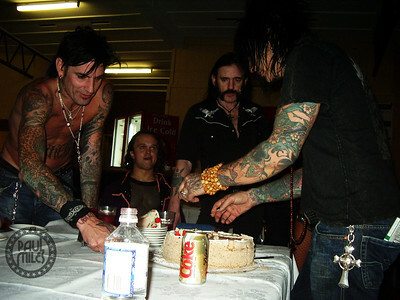 Nikki Sixx sharing out his birthday cake to Tommy Lee, Mighty Mike and Lemmy, backstage after the Blackjack Festival on 10 December 2005 at the close of their Australian Tour.